How did your first week go with organizing student numbers and pencils? 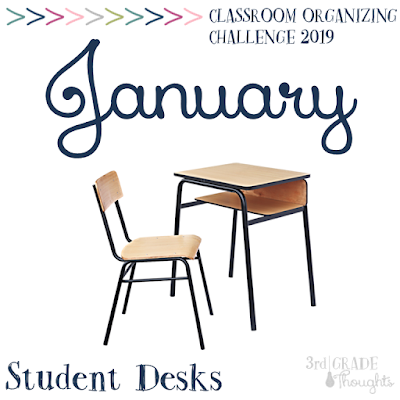 These small steps will add up to long-lasting benefits as the rest of this challenge and your school year continues, so be sure to read January's Week 1 Challenge HERE if you haven't done so already. Today we'll be building on last week's and laying the groundwork for the rest of this month by discussing name tags and flexible seating. You may have one, both, or neither of these in your classroom now, but hopefully you can tweak some of these challenges to fit your own classroom and needs. One of my favorite things to shop for in the teaching world pre-TpT (gasp!) was student name tags. I loved all of the choices and the possibilities that each offered. Now, thanks to TpT, there are so many options and choices, you can truly find something customizable to your grade, subject, and style. I always defaulted to my Chevron Name Plates because of their simplicity and how they matched with the rest of my chevron classroom. One of the ways I always liked to change up name tags after Winter Break is writing their names in cursive instead of print. We still teach cursive at our school, thankfully, and it's such a fun and simple treat for the students to walk in and see on their first day back. One way I have worked to combat the first two issues is with laminating and good clear tape. The type of tape that I have loved and use regularly in my classroom is Scotch Book Tape. It is more expensive that store-brand packing tape, but the quality is *far* superior, so I find myself using a lot less. This, paired with laminating the name tags, has provided a nearly indestructible system that worked for many years. My main concern at our new school with only tables are the space issue and how worn out they get. 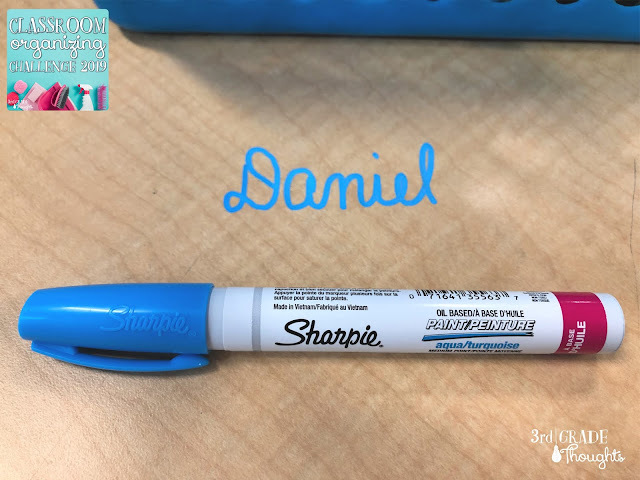 Because they are often in someone's work space, the tape peels, they get marker or pencil marks on them, and when we are involved in projects, they just seem to be in the way. Plus, with the lack of work space, they seem more visually cluttered than they have in years past. My new strategy in 2019 is to use Sharpie Paint Pens. Be warned: do not use regular Sharpies, as they will smear when you wipe the tables and create more mess than it's worth. There are so many fun colors: from brights, to basics, to metallics, to white and black, there are ways to customize these to suit whatever style you have in your class. I am a huge teal fan, so the aqua blue is my go-to! The disadvantage is that these names don't provide any of the helpful resources that so many great name tags do. But in my situation, the added workspace and decrease in visual clutter was more important. Before flexible seating, another way I increased workspace was to attach student name tags to the backs of chairs. 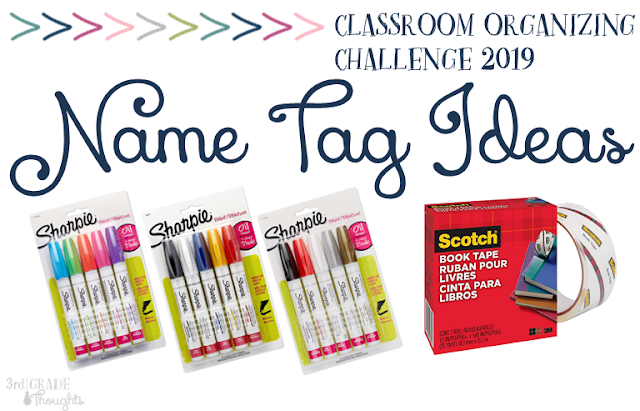 This created more table space, less opportunity for picking or doodling on the name tags, and still allowed for substitutes to see names and students to have a dedicated space in the room. Plus, switching table spots was a breeze!! 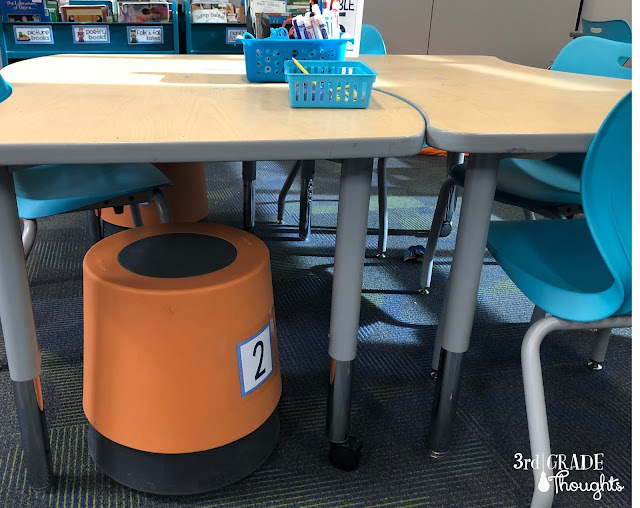 Since incorporating more flexible seating, however, I've had to stop this practice and instead go to a more systematic approach to ensure that all kids who would like to use certain seats to learn, can. Fortunately, our new school came with furnished flexible seating options. Unfortunately, the specific models aren't for sale elsewhere, but I have found some alternatives that can help explain our system. In my classroom, I have 8 wobble stools, 28 cushioned sit spots, 4 bean bags, and 18 traditional classroom chairs. Thanks to my teammate's brilliant suggestion, we rotate through our flexible seating based on the special we have for the day. Our district is set up on an A, B, C rotation, so we rotate through Music, PE, and Art every three days. My students are divided up into three groups and are A kids, B kids, and C kids. On their chosen day, they get a wobble stool (they are all the same, so I numbered them to make transitions and management easier) and access to the bean bag chairs during work time. Each wobble stool is numbered and they are all assigned a number so grabbing their stool first thing in the morning is a breeze. Some students don't like the wobble chairs, so they will keep their traditional chair, but still take advantage of the bean bags. I have enough cushioned sit spots for every student in class, so any child can use one during work time and return it when finished. Some like to use them on top of wobble stools and chairs, too. Financially, these can be daunting to accumulate, but I would highly suggest creating a Donors Choose project to help. 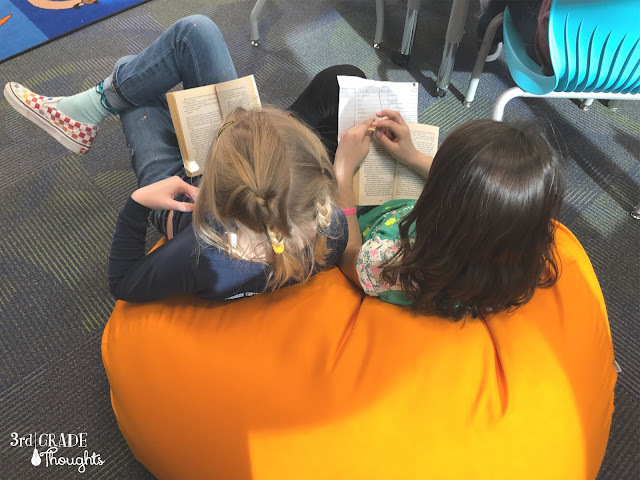 There are hundreds of blog posts about flexible seating, but I encourage you to think of the big-picture in your classroom, the space you have available, and the needs (and age) of your students. One thing that is not allowed on this challenge is purchasing things because they might look like a good idea and having no plan of storing them or finding a specific spot for them in your room. Instead, be intentional as you observe your classroom and look for gaps that flexible seating could possibly fill. Some, like yoga balls and bean bags, take up quite a bit of space. Others, like cushioned sit spots and stackable lap desks, don't. But all of them need to be a purposeful addition in order to benefit you and your students. Picture them in-use and not in-use/stored to decide if their addition is consistent with your end goal. 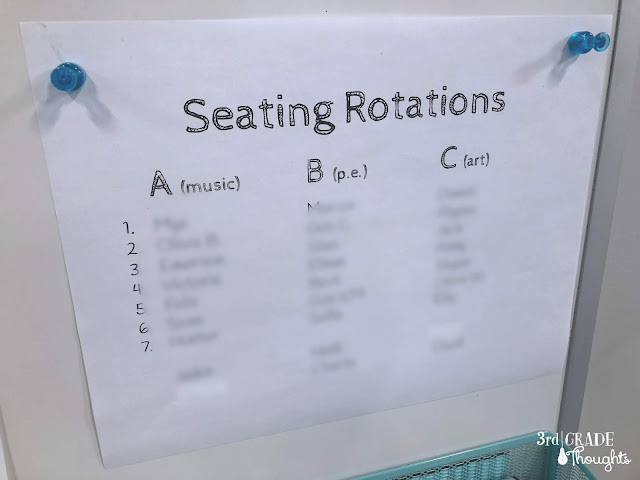 If and when you do introduce new seating choices, remember at first that every single student will want to give them a chance. After a few work sessions, however, they will become more normalized and soon just an everyday part of your class. Creating expectations around use and care with your students will be an essential part of any new item you bring into the room, and this may go above and beyond the time you have allotted for this challenge. Instead, why not take the remainder of this year to observe, notice, and plan your flexible seating needs for next year? How are my current name tags working? not working? Is there ample workspace for the students with the name tag we're currently using? What is the purpose of the current name tags? Reference? Are they utilized by the students? Could I use the back of seats? Is there another location that works? Would Sharpie paint pen be a viable alternative? Are names needed at all? How easy will it be to change names when spots change? 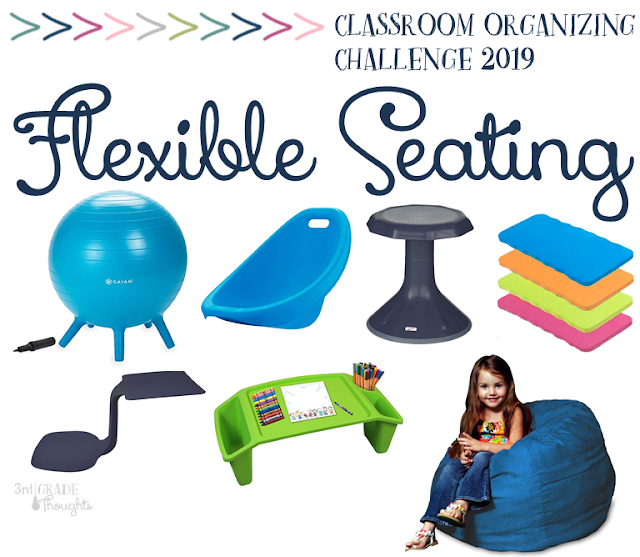 What flexible seating options are available in my classroom? How will I set up expectations with the students? Anchor chart? Posted sign? Modeling? Will all children want access to the seating? After the initial excitement has worn off, how many will still want to utilize them? Do I want to let students choose all of the time? Some of the time? Are there rotation schedules I can create for each type of seating? Are there other ways to make the flexible seating accessible and fair? When and how can I incorporate new seating options authentically and with intention? How will I address costs of including some new options, if that is the direction I would like to go?